If you haven’t noticed, there has been a rise to bullet journals (or ‘bujos’) lately. I usually don’t tend to follow trends because they are always fleeting. I don’t know if bujos are a trend or a start to transforming the journaling world, but I have definitely become a bullet journal advocate. I started a month ago in June, and it has proven to be a creative, meditative and optimistic outlet for me. I love the freedom that bujos give me, and the thought and focus needed when you sit down and plan your monthly/weekly/daily plan. This post is not about bujos, but it will help me underline a key factor to successful journaling. There are many types and ways to journal. You may choose to journal about your dreams, projects, personal wishes, etc. It’s like keeping track of thing(s) that you don’t want to forget. The key thing, I believe, if you want to use journaling to your benefit is if you write out your long-term goals and plans. I used to keep these yearly journals/dairies, and they never lasted for more than a few months. The confines that these journals came with inhibited my creativity and freedom to create something that I wanted to emotionally involve myself with. Most importantly, they focused on day-to-day occurrences, and little or no room for long-term weekly/monthly plans. 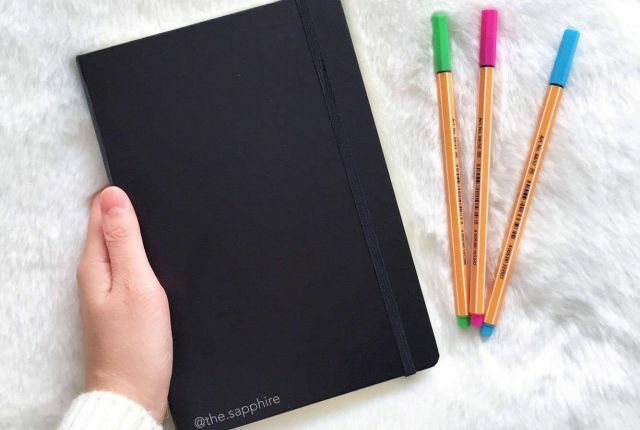 If one of your aims to keep a journal is to track your progress and aim to improve (within a time frame) on certain aspects of your life, the best way is if you do it yourself. But it depends on you. Maybe you have always used the typical journals, and are fine with it. The only yearly journals that I have stuck with for a whole year are the school journals, only because I limited it to keeping track of school homeworks, assignments and tests on that journal. Monthly tasks and goals page: I have separated this page into 6 sections which I aim to become better at this year. This includes Fitness & Health, Education, Music, etc. I only write out ambiguous goals, so that nothing is ‘fixed’. In the following pages, I will start to plan these goals out. Month outline: I draw a table, with the date on the y-axis and morning / afternoon / evening on the x-axis. This enables me to write out my events and activities as I go through each week. As I can’t know exactly what I’m doing each month, I fill this section out every week. Habit tracker: Basically, I draw a table (horizontally) with the habits that I want to track on the y-axis and the days on the x-axis. By filling in the boxes in when I do accomplish a habit, this allows me to understand and monitor my daily activities. Weekly plan: Before the start of each week, I refer back to my Monthly tasks and goals and Month outline to make this plan. I write out the things that I want to focus on the most this week, and this is the page where I’ll review every day for the rest of the week. Routines (random): Having routines gives me a sense of stability, so I dedicated a few pages this month to planning out my ‘ideal’ Morning, Afternoon, Evening and even Weekend routines, where I write out all simple and challenging tasks that I could do on these days. How does this help? Every time you feel overwhelmed, you can always flick back to this page to get yourself right on track again. Soo… what can you do now? Get yourself a blank journal. Recommendation: The Leuchtturm1917 are amazing. Choose the dotted page style if you want more freedom to create your plans. Make sure it’s a physical journal. If you only have an online/electronic form of journal, trust me – it will hinder you. Use your phone. If you have a regular-sized journal like me, chances are that you will not be carrying it around all day. It’s tiresome and pointless. So take advantage of technology and use your phone for things like keeping track of events and tasks. The apps that I use are Calendar, Reminders and Notes on the iPhone. Check out this post on more details as to how I use them. Trial and error. The more you do something, the better you will become at it. When you start to journal, if you’re keeping track of many things at once, you may start to see more efficient ways to organize yourself once you have been doing it for a while. Don’t give up! I’m curious: For (bullet) journalers out there, what kind of structure do you follow to keep track of your long-term plans?